What Do Our Artists Say About Us? Last summer, while interning at a contemporary art gallery in Manhattan, my boss assigned me the prestigious task of purchasing a jeroboam (a three liter bottle) of champagne for her friend’s birthday. When I called a local liquor store, they offered me not only a Jeff Koons edition of champagne for double the price, but also gift wrap printed with Koons’s “Balloon Dog,” which they generously provided free of charge. My coworkers were ecstatic at my find—this was the “perfect” gift from the gallery. It was expensive-looking, associated with class, and plastered in vogue artistic images. In short, it represented art. 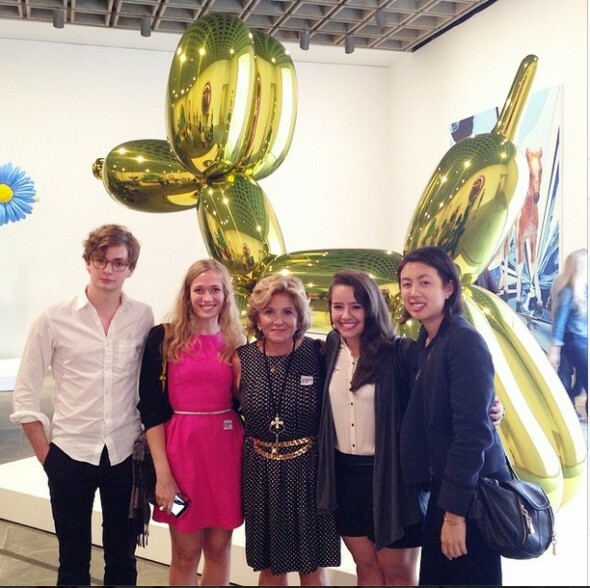 Maneuvering throughout New York City last summer, monuments to one artist, Koons, were impossible to avoid. Window displays featured reproductions of his balloon animals, from tiny children’s toys to fine china sets with gold prints. 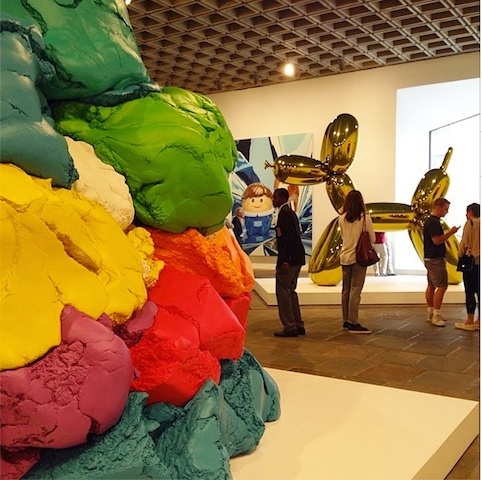 The Whitney Museum curated Jeff Koons: A Retrospective (on view until October 19), for which queues of anxious museum-attendees wrapped around the block. Taking up all the museum’s exhibition spaces except for the fifth floor, a total of 27,000 square feet, the Koons exhibit is the biggest show the Whitney has ever devoted to a single artist. Advertisements plastered on bus stops and subway featured his name, two floating basketballs from his Equilibrium series forming the Os, and the motto, “a retrospective as extraordinary as his art.” Each morning, while waiting for the 7 train, I wondered what that slogan said about this retrospective specifically. How can an exhibition be any less than the sum of its parts—and, if it can be, is that the bar to which we are holding our curators now? The most public and publicized Koons display was at H&M on Fifth Avenue. The shop’s windows were plastered with two huge images of his Balloon Dog in celebration of the launch party for the limited edition handbags—“real leather”, bragged the labels— that featured a gold print of Koons’s iconic Balloon Dog. The original work, sold for $58.4 million, makes the handbags seem an incredible bargain at just under $50. At the “opening,” huge screens flashed the phrase “Fashion Loves Art” while Koons signed autographs from the second-floor balcony. Like the recipient of the champagne birthday gift, today’s average arts and culture consumer is drunk on the day’s mandated hot artist. Receiving a jeroboam in the mail is an invitation to feel elite, socialize, and indulge. So is the opening of a huge Koons retrospective, or the ability to purchase an artist’s name via an affordable fashion brand: society is invited to experience artwork that is sold in the millions, for free or close to it. These moments provide portals into enriching cultures that might seem alien to us, but they should not be confused for culture themselves. Excess is not interchangeable for class or worth, humor for thoughtfulness, or pleasure for impulsiveness. While I support the movement of arts into the lives of the average citizen, not just those working in the arts field, a monopolized imposition of one artist into every fact of our lives promotes a brand, not cultural integration. That any one artist could dominate the New York City artistic and commercial scene so comprehensively is troubling. In the city over the past several years, particularly over this summer, Koons has become a synecdoche for the contemporary art field. While he is notorious for serving the art market, arguably at the risk of intellectually challenging work, his quality of work is not under the microscope here: our reaction to the commercialization and advertisement of one monolithic art star is. The masses might not have made Koons’ career—gallerists, curators, and other art world magnates did—but we accept his mega-stardom, his eclipse of other artists, at the expense of a fertile, diversified artistic scene. Society is smart enough to know the name of more than one artist. Koons may be “trending” now, but that is not a good enough reason for us to turn our gaze away from other emerging and established artists. If someone soars to hotness at a gallop, it is not unlikely that the quality of his or her work will not stand the test of time. Part of judging the quality of a piece of work is asking what its legacy will be—will this art be relevant in 100 years? If so, for which qualities will be it remembered—market performance or innovation, style, and content? Blasé terms such as “extraordinary,” “interesting,” “avant-garde,” or the art world’s favorite, “record price,” do not enhance but rather provide crutches for more challenging critical thinking about works. If you are so inclined, go see the Koons retrospective at the Whitney, but take the time to also see the other exhibitions. Like the Koons show, Edward Hopper and Photography and Collecting Calder are on view until October 19 (if you have an NYU ID, you have free admission). My favorite game to play in galleries and museums is choosing which piece I would steal if I could (the owner could give it to you, but where’s the fun in that), regardless of financial value. Such an exercise forces you to engage in the works, think about living with a piece, and defending its worth to you to others. To become responsible consumers of the arts, we need to improve our artistic tolerance. Connoisseurship does not need to be time intensive, only conscious. We do not need to travel to France to learn to drink champagne, but we will learn to better enjoy and talk about its sensual experience if we sample different brands in diverse company. The author (far right) and her coworkers at the Whitney.